It was blazing-fast, using cheap creatures and burn spells to quickly finish off an opponent. It used equipment to buff its smaller creatures for maximum value. It was capable of drawing lots of cards. Its low mana curve and card drawing engine allowed it to run very few lands. Stripped to its core, Kuldotha Hawk relied on tokens, burn, pump effects, and card advantage. 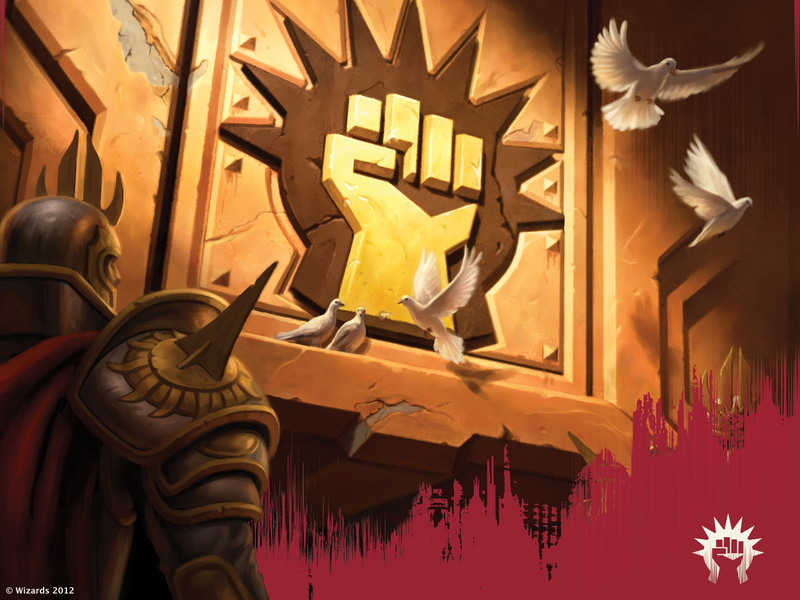 Boros seems the perfect color combination for these four elements, so to build something similar in the current metagame, that seems the ideal starting point. So what analogues exist in the current cardpool? Tokens: Magic 2015 gave us two solid options that produce multiple tokens in Raise the Alarm and Triplicate Spirits. Other possibilities include Eyes in the Skies, Flurry of Horns, Hive Stirrings, and Knight Watch. Burn: This is the easy part. The cardpool is chock full of cheap burn spells, including Annihilating Fire, Lightning Strike, Magma Spray, and Shock. Pump Effects: For power-boosting equipment, our only choices are Riot Gear and Skyblinder Staff, neither of which are very effective. But Fortify and Inspired Charge are great for tokens, while Bestow creatures and/or Auras are also worth considering. Card Advantage: This is the hardest element to replicate. The closest one can come in Boros colors currently are the token spells, which give you pseudo-card advantage by producing multiple creatures for only a single card. Auramancer and Heliod's Pilgrim can create additional advantage as well, assuming the deck includes relevant Enchantments to recur or search up. Next time, I will take a look at how one might combine these elements to create a viable decklist. In the mean time, I'd love to hear your thoughts on this archetype! Finally, don't miss out on the new Standard Pauper league that Chris Baker is hosting: "M" Core All-Stars League. This will be run similarly to my Multicolor Mayhem league, and Writer Adept is donating 20 tickets to the prize pool! Get all the details in the link above, and I hope to see you soon on the other side of the virtual table. Also, I think Massive Raid is nuts in the token list. Very likely to deal 10+ damage, which makes pushing early damage through pretty important and then sometimes switching gears to just build up a board instead of trading off a lot of tokens to hopefully dome them. The problem I see right now is that the white decks with Heliod's Pilgrim can gain so much life always putting Ethereal armor on something with Lifelink. I think Pacifism is the only easy to cast answer for the creatures that grow out of control. Even Gods Willing makes all the other enchantments fall off at least.